On July 13, 1863, poor and working-class New Yorkers protested new rules that allowed wealthy Americans avoid military conscription (the draft), kicking off the worst domestic conflict in American history outside the Civil War. The New York Draft Riots of 1863 began as a violent protest against rules that allowed wealthy Americans to avoid serving in the Civil War. The protests, largely led by working-class white immigrants, quickly turned into racist conflict. 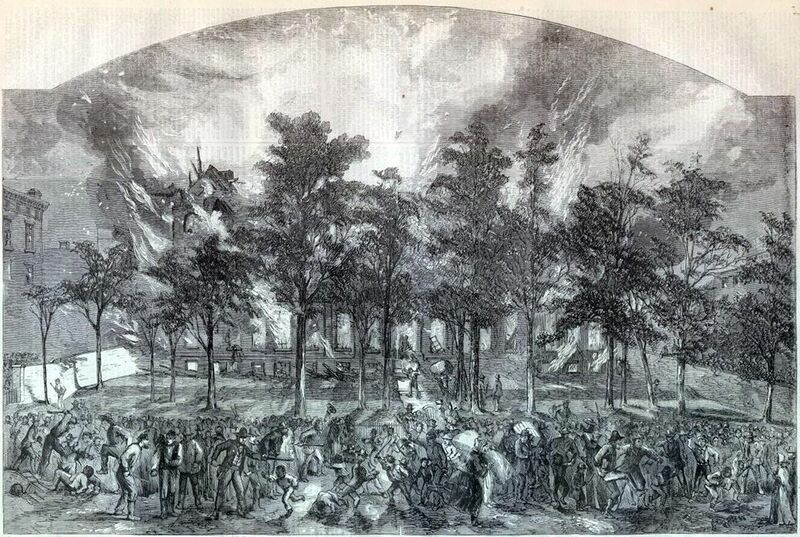 The Colored Orphan Asylum, for example, was burned to the ground. All 233 orphans were evacuated before the violence, depicted in the illustration above. On July 13, 1863, poor and working class New Yorkers protested new rules that allowed wealthy Americans to avoid military conscription (the draft). These protests quickly turned violent, setting off the worst domestic conflict in American history outside the Civil War itself. The price to avoid the draft was $300 (almost $6,000 in 2014). Men who paid this fee were able to work or go to school instead of serving in the Civil War. The New York Draft Riots turned into a race riot. Many white immigrants to New York were uncomfortable with the Emancipation Proclamation, issued earlier that year. In addition to racist prejudice, these immigrants feared increased competition for jobs from newly freed African Americans. As a result, African Americans, their homes and businesses were targeted by rioters. More than 115 people died in the riots, including police and rioters. contest between organisms for resources, recognition, or group or social status. mandatory military service. Also called the draft. mandatory military service. Also called the conscription. (1863) declaration by President Abraham Lincoln during the American Civil War that freed all people held as slaves in most rebellious states. to establish something as a goal or aim.